We always have a number of restaurants at the back of our heads that we know we can always rely on for a tasty, non-fussy meal and Ruby Tuesday happens to be one of them. Not feeling up for any eclectic dishes and wanting a taste of the familiar, we headed over to Ruby Tuesday to see if they’re still at the top of their game. With dim lighting and dark wood panelling, the place is anything but tacky; the décor is simple and steers clear from any cliché American-diner references. The choice of background music playing, however, begged to differ with the bubble-gum pop hits of the 2005-2010 era playing non-stop during our whole visit. Our waiter greeted us outside and led us straight to a table in the requested non-smoking section, coming back a couple of minutes later with our menus. The menu offered more or less the same options it always has alongside new, rather interesting additions including: the Hickory Barbecue Chicken (65 LE), Hickory Barbeque Salmon (105LE), New Orleans Jambalaya (80LE) and the Black Fire New York Strip Steak (130LE), amongst others. We called on the waiter, who instantly came and took our order. Our soft drinks arrived in a matter of seconds and our food arrived about 20 minutes later. Our Double Combo Fajita (75 LE), comprised of grilled chicken and beef strips atop grilled vegetables, came with sides of spicy rice, tortilla bread, sour cream, cheese and salsa dip. The fajita arrived sizzling and both the chicken and the meat strips were cooked to perfection. The Parmesan Chicken Pasta (65LE) comprised of penne pasta topped with fried chicken strips and Swiss cheese drizzled in creamy parmesan sauce was, as its description suggests, sumptuous but oh-so-heavy. We found the mixture of cheese and creamy sauce to be a bit too hefty for our taste. The service at the eatery, we must say, was on point, with the waiter coming by towards the end of the meal to check that everything was alright. In a nutshell, Ruby Tuesday is still going strong, thanks to its alert, efficient waiters and its occasional new additions to the menu. The fajita was everything we had hoped for, but the same cannot be said for the pasta- it is definitely not for the faint of heart. Ruby Tuesday runs occasional offers. All throughout this month, you can get a 50LE voucher if you’re cheque exceeds 200LE. 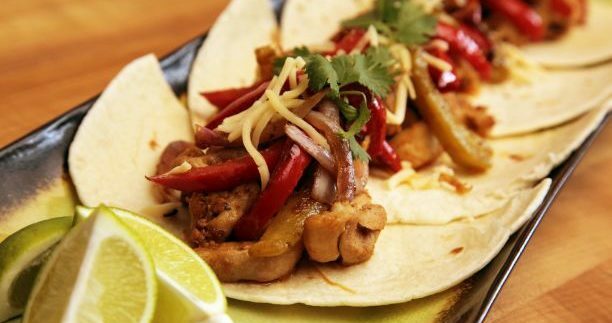 The tender, finger-licking fajita left us asking for more! The nauseatingly out-dated playlist playing in the background!